May 23 - Day Trip 1 Montreal Botanical Gardens - SEATS ARE GOING FAST - ONLY 6 LEFT! Tickets for the both bus trips will be on sale at the opening meeting on March 17 and thereafter at Hudson Village Travel. Please note that each trip is to be paid by a separate cheque made out to Hudson Village Travel. I love our climate – we always know our winters will be long and hard, but we also know that our summers will be warm and sunny. As you read this you will, no doubt, be thinking about your garden as we are preparing for our first meeting of the year. You will notice that we have two trips planned – both include the opportunity to buy plants so it is time to start thinking about your shopping list. We are delighted to welcome Christine Gibb who has volunteered to take on one of the most important functions in the club – the Speaker Programme. As you will see in this Newsletter she has been very successful. We have an interesting blend of speakers who will be bringing their talent and expertise to our club. You will not want to miss any of the evening meetings! Enjoy the summer. I have enjoyed being your President and thank you for the patience and kindness you have shown me over the last two years. The theme of this year’s flower show is Cuisine Arte - flower arrangements in everything but the kitchen sink! The information page is posted on our web site and the complete booklet will be available in the spring. Once again the flower show will be held at the Stephen F. Shaar Community Centre (394 Main, Hudson). Registration will be on Friday, July 17 and the show will open to the public at noon on Saturday, July 18. Meetings are held on the Third Tuesday of each month from March to November at St. James’ Church, 642 Main Road, Hudson. Guest fee for regular meetings is $5 (does not include the Garden Party). Meetings now commence at 7:30 pm; invited speakers begin promptly at 7:45 pm. Tous les membres sont les bienvenus. Veuillez toutefois prendre note que nos conférenciers feront leurs discours en anglais. Remember: Instead of waiting until the holidays, nonperishable food items will now be collected at each meeting and donated to Le Pont Bridging throughout the year. The theme of this year’s flower show is Cuisine Arte - flower arrangements in everything but the kitchen sink! Please refer to the Floral Arrangement sheet for a description of the arrangements and start planning your entries. The show will be held Saturday July 18, at the Stephen F. Shaar Community Centre, with registration the evening of July 17 (5:00 pm to 8:30 pm). Click these links for the information sheet: English or French. Please contact Kathy Conway at 450-458-7604 if you have any questions.The show is open to the public noon to 4:00pm. Topic - David Easterbrook has been studying and creating bonsai for over 40 years. After apprenticing in Japan he started his own bonsai nursery and later became the Curator of the Montreal Botanical Gardens’ bonsai collection for almost 30 years. He currently boasts an eclectic collection of more than 900 bonsai. Have you ever dreamed of travelling the world to discover its most beautiful gardens? Well, Larry Hodgson, the travelling gardener, has done it for you. So sit back and enjoy this trip around the world encompassing gardens of all styles, types and sizes. Travel from North America to Europe, South America, Asia, Africa and even Australia in this panorama of all that is green and beautiful on this planet, all with the informative and amusing comments of someone who’s passionate about horticultural beauty. Why won’t a plant grow in your garden while your neighbour can grow it right next door? The answer is almost always in the soil. This presentation explains everything there is to know about your soil. Your garden is 90% dirt, it’s about time we understood it better. 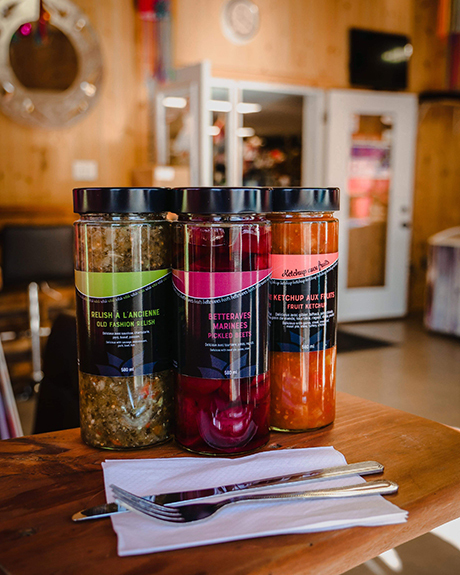 Finnegan’s Market - 775 Main Road, Hudson. Please drop off labelled and potted plants before 10:00 am. These amazing arachnids are one of the most diverse groups of animals on the planet. Based on his upcoming book, Chris Buddle's talk will convert you into an arachnophile (spider lover). So, next time you bump into spiders as they move about your garden, you will see friends and familiar faces instead of fangs. An exciting opportunity to see demonstrations of how to design and make your own Christmas decorations. HGC is a non-profit organization, but sound management means that we occasionally accumulate a budget surplus beyond our operating needs. The Hudson Garden Club (HGC) is pleased to announce it will again offer an education grant in 2015 to a student in the field of horticulture or environmental studies. The $500 grant will be awarded in May to a student chosen by the HGC Selection Committee who meets the following criteria. A student who is currently reigistered in a CEGEP, college or university programme related to horticulture or environmental sciences. Deadline for receipt of the submission is April 25, 2015. As a member of HGC and through HGC’s membership in the FSHEQ, 2015 membership card holders may be privileged to receive varying discounts from participating suppliers. Present your card to the cashier BEFORE your order is rung up. Please come and join us in this community event and proudly display your club and "green thumbs"! Annual general meeting, including election of officers. Note: please come early to renew your membership and reserve a place on the bus for our day trips. Reid Allaway, co-manager and founding member of Tourne-Sol Co-operative Farm. Topic - Green manures and crop rotation on an organic vegetable farm. David Morgan, Lee Valley Tools Ltd.
Topic - Flower arranging A demonstration of how to make award winning arrangements. This meeting is open to the public at no charge. Tour local gardens - $10 for nonmembers, payable at the first garden visited. Click here to print a map, or pick up a map at the first garden you visit. La magie est en place! 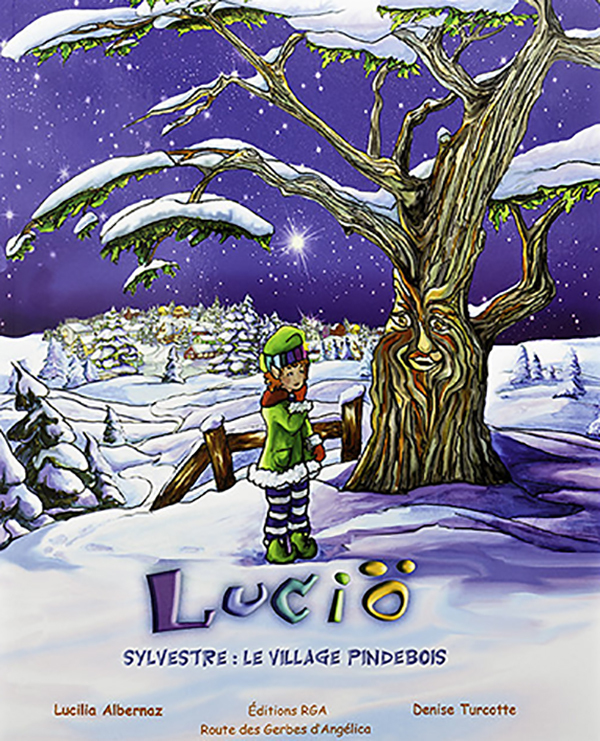 C'est le soir que les lutins apparaissent dans le village de Lucio, dernière innovation de la féerie de Noël. Voyez-vous l'Académie où Lucio a appris sa magie? Il faut le voir en vrai dans son village car il peut peut-être vous saupoudrer de sa poudre magique!! Magie de Noël à partager! 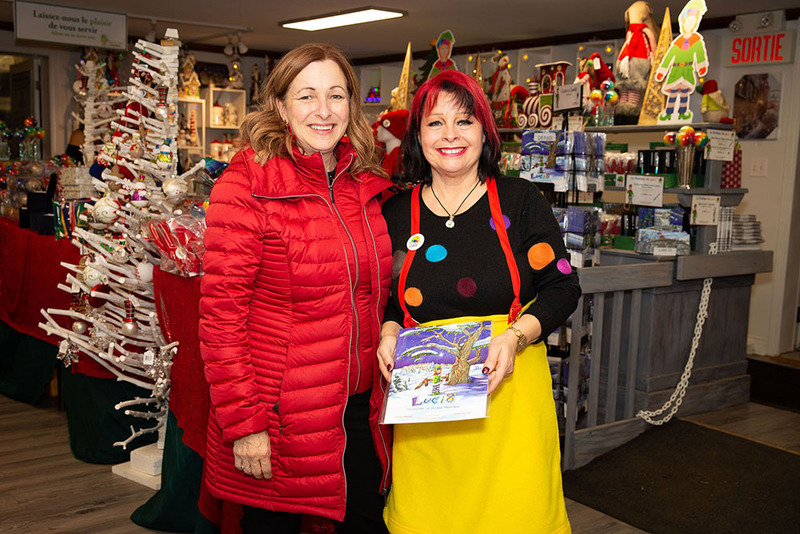 Un beau conte de Noël à offrir en cadeau : Le conte mirabelois « Luciö - Sylvestre: Le village Pindebois », écrit par Lucilia Albernaz, illustré par Denise Turcotte et édité par Route des Gerbes d'Angelica. Et le partage continue car 1$ par livre vendu sera remis aux banques alimentaires de la région. La Féerie de Noël est commencée. Venez rencontrer l'auteur du conte de Luciö! Lucilia Albernaz, auteur de Luciö - Sylvestre: Le village Pindebois vous attend à la féerie de Noël pour visiter, en plus des décors existants et renouvelés, le village de Luciö construit par les lutins de Route des Gerbes d'Angelica. À gauche, l'illustratrice des superbes dessins du conte, Denise Turcotte, lors du lancement médiatique. Lucilia présente le livre qui est une œuvre d'art! Accompagnez vos repas des fêtes avec nos betteraves marinées, ketchup aux fruits et relish à l'ancienne. Produits maison faits sur place par Francine. En vente à notre boutique. Une petite gâterie des fêtes! Un petit spécial pour les fêtes? 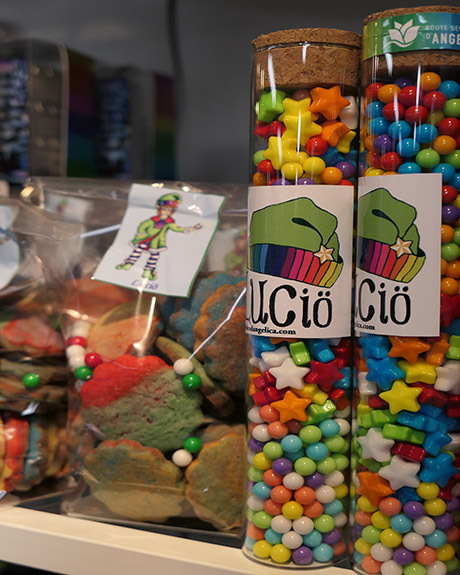 Biscuits au beurre et bonbons colorés Lucio pour les petits et les grands. Découvrez la gamme de produits dérivés de Lucio en ligne ou à la boutique. 2019 The Lambert de Wit Education Grant - print the application form. ATTENTION Any student who has been accepted in a CEGEP, college or university program related to horticulture or environmental sciences or a postsecondary horticultural and/or landscaping course and lives in Hudson, Saint Lazare or Rigaud can receive a grant of $500. WHY? A great way to help you in your further studies. DEADLINE. Last date for receipt of application is Tuesday, April 30, 2019. 2019 Subvention de l'éducation Lambert de Wit - imprimer le formulaire. POURQUOI? Il s’agit d’une excellente occasion d’obtenir une aide financière pour vos études. ÉCHÉANCE. Les demandes doivent être reçues au plus tard le mardi 30 avril 2019. N’ATTENDEZ PAS, FAITES NOUS PARVENIR VOTRE DEMANDE DÈS MAINTENANT!